New York City is a city of dreams, and of legends. It’s arguably the most mythic city in America, obviously the first point of contact for many immigrants and for many dream-seekers who make their way to New York each year to begin their careers and launch their dreams. To give just one example, the artist Andy Warhol was originally a Pittsburgh native and he came to New York City in the 1950s to get a job as a commercial artist. His New York Study – dubbed “the Factory” – became famous throughout the 1960s, and you can’t really conceive of Andy Warhol without “seeing” him as a “New Yorker” in spirit. As New York City’s premier watch repair shop, we – too – see a lot of dreamers and admire a lot of legends. People bring their Rolexes, their Breitlings, their Omegas into our shop for a “checkup” or for an Omega watch repair, and we get to marvel at these works of art. Just as Andy Warhol saw no contradiction between “mass produced” and “art,” our watch lovers see no contradiction between the “works of art” that are these luxury watches and their workaday function of keeping time. The latest to catch our eye comes from Omega, specifically their Omega Speedmaster “Porsche Club of America Limited Edition.” Only ninety-nine timepieces are planned for production, and the The OMEGA Speedmaster “Porsche Club of America” Limited Edition combines OMEGA’s most advanced innovation with the PCA’s expert motoring knowledge, and wonderfully pays tribute to the famous sports car as well as the world of speed. This ultra limited timepiece will be available for $12,911. Not surprisingly, the watch has picked up incredible press. 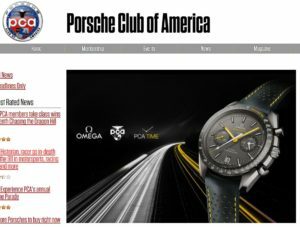 The watch comes from a partnership between the Porsche club of America and Omega – so it’s combining a passion for “fast cars” with “cool watches.” You can learn more about it from the official announcement, here. The watch features a 44.25-mm case of polished and brushed gray ceramic with an exclusive plasma treatment. It features a lot of yellow, which is in accord with some of the color schemes found on Porsche automobiles especially int he braking components. The Omega Speedmaster Grey Side Of The Moon ‘Porsche Club Of America’ Limited Edition (Live Pics & Pricing). This article explains more of the back story, more of the history of the Porsche Club and why the partnership with Omega came to be. This article has a nice direct link to an amazing microsite that has photos of this incredible beauty – click here to check that one out. There should be some watches still available, so it makes a great Christmas gift if you “act now.” But really for something of this beauty – and for anyone who loves “fast cars” and “cool watches” – this is a combo you just can’t miss. If you are a Porsche lover and if you are a watch lover, then gift it to yourself – or if you love someone who is, gift it to them. Now, let’s be honest. Even with the affluent customers who come to our New York City watch repair shop with an Omega in hand for a repair or tune-up, we don’t know many who own Porsche cars. Cars and New York City don’t exactly play nice with each other. A few do – that’s for certain, but their cars might be parked outside the city Upstate, on Martha’s Vineyard, or in the Hamptons – the places where the glamorous hang out. We get that. But many New Yorkers who take the subway and use Uber also love cars and love watches, so they might be interested in this watch just to own the watch for the watch’s sake, or as a collectible as it will no doubt rise in value over the years. In fact, we get quite a few people bringing in Omega watches that are ten, twenty or even thirty years old. We can repair all of them – as these watches are not just collectibles but also works of art. Which takes us full circle back to Andy Warhol. Warhol constantly reminded us that art and life go together, that they shouldn’t (and don’t) live in separate compartments. What you drive says something if not about who you are then about your sense of style. And what you have on your wrist – whether that’s an Omega, a Rolex, or (God forbid) a Timex – says a lot about who you are, and what your sense of style is. Vroom vroom. Check out the Omega Porsche watch today, or bring your Omega by our shop, for the best watch repair in New York City!